Shortly after the article published, I was messaged on my facebook page by a 28 year old, self employed web developer in BC named Victor Temprano. He has worked on and developed an invaluable resource I wish to share with you all. It is a resource that can allow us to take an ACTION and EDUCATE ourselves about the land that we stand upon. 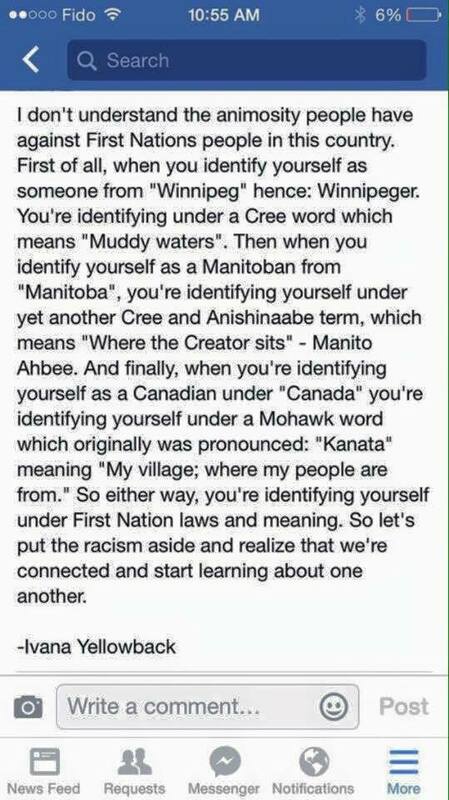 Most cities in Canada, as well as Winnipeg, Manitoba and so many street names are all actually rooted in indigenous languages. 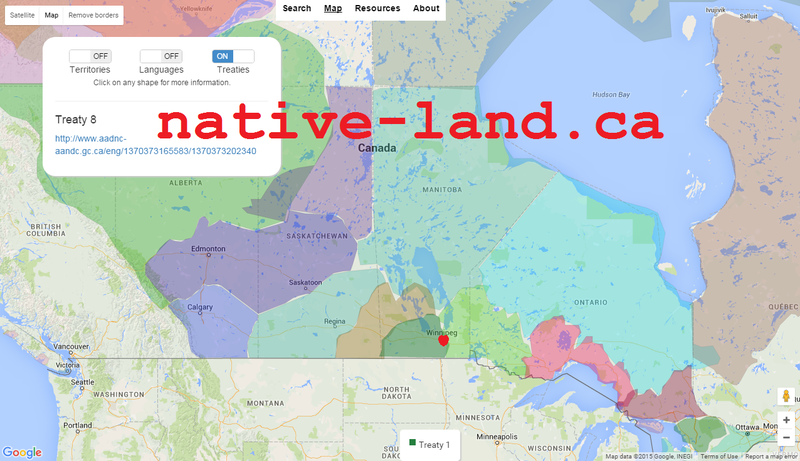 Furthermore, this amazing website allows all of us, indigenous or Canadian to have a place of learning about the treaties, languages and territories that collectively are the true history of this land. Welcome to Native-Land.ca. This is a resource for Canadians (and others) to find out more about local indigenous territories and languages. It is a small step in educating ourselves, but the beauty is that once we learn something, it cannot be unlearned. And if we are gonna be serious about understanding the indigenous experience on Turtle Island, a great way to start would be to learn more about “our home and native land”. Check out the below interview I did with Victor, who is of various European heritages, and is not himself indigenous, about why he believes it is all of our responsibilities to ‘plant a seed in settler consciousness and to encourage settlers to engage with Indigenous history and nations’. Thanks for the interview Victor, hope you all check out the website and share it with your networks! Victor: I’m Victor Temprano. I’m 28, a settler of various European heritage, and grew up in British Columbia (Okanagan territory). I have an MA in Religious Studies (focusing on Buddhism, though I’m not a Buddhist), and I work as a self-taught web developer and programmer. MC: What is the main goal of native-land.ca? Victor: The main goal of native-land.ca is to plant a seed in settler consciousness and to encourage settlers to engage with Indigenous history and nations. The site is rhetorically designed to be a little non-confrontational (at first) … hence I write “Learn more about where you live”, as opposed to “Whose land are you on?”. I don’t want settlers to shut down already when they visit the site, I want them to say “oh, interesting”, and then start to read more. Ideally, it will open their hearts and minds enough so that more complicated and complex ideas about Indigenous-settler relations can find a space and voice. Victor: I am not indigenous, my ancestors are mainly European – Spanish, Dutch, German, etc. MC: Why is it important for non-indigenous people to involve themselves as respectful allies in the indigenous struggle in 2015 Canada? Victor: It’s important for settlers to engage with Indigenous history and nations on many levels – spiritual, physical, emotional, and more. It’s not to ‘help’ Indigenous people or cultures (at least not in the traditional sense of ‘charity’), but to help settlers get educated, to grow and to begin the hard process of decolonization. I don’t know what decolonization really looks like or feels like in our settler society, but I know it needs to happen, whether for moral, environmental, spiritual, legal, or historical reasons (or more). It is a inter-generational struggle to decolonize, and it’s already been going on, and now is a good time as any to find a way to engage one’s skills in a meaningful way. MC: How did you learn how to make websites? Who do you want to visit your website? Victor: Anyone can visit my site, and I encourage everyone! The site is consciously aimed at settlers, who in general across Canada are completely oblivious to the traditional territories they inhabit. This is mainly out of ignorance due to so much Indigenous history having never been included in any kind of Canadian history. It could be a teaching tool as well, if it is prefaced by discussing the problems of mapping and colonialism. Also, many Indigenous people or communities may find the site useful or interesting. Others may find it handy as a general resource. Many people, regardless of background, have submitted critiques or corrections and I welcome these and thank people for them!! MC: Why do you believe those people should learn about the land they live on? Victor: I think that learning about the land we live on is a relatively “soft” and friendly way for settlers to begin to engage with Indigenous issues, history, and lived reality today. So much of colonialism is bound up between treatment of land and peoples – the land as “terra nullius” and therefore the people as nonexistent – and this map tries to ensure that settlers can’t simply wipe away Indigenous nations as having never existed on the land. Realizing the very land we live on has older names, older histories, older peoples – this hopefully “plants a seed” that can grow into a wider engagement and interest in Indigenous history and people on the part of settlers. I am concerned about the use of borders and colonial distinctions, but still feel it’s better to begin on this project than to never start it at all.